was actually not consumed until the time of the British Raj. India grew a large amount of tea in areas such as Assam and Darjeeling, however the majority of Indians consumed coffee. The British East India Company became concerned as they realized they were losing a vast source of income to the Chinese, who had a virtual monopoly on tea sales. Thus, the East India Company began promoting tea to Indians. At first, the Indians were skeptical, and did not want to abandon their strongly flavored coffee. But eventually someone added strongly flavored spices to a sweet and milky tea and masala chai took off! The chai is sweet and spicy with a subtle burn at the back of the throat. It is, in a word, wonderful. The tea used in chai is very crucial to the final flavor of the tea. 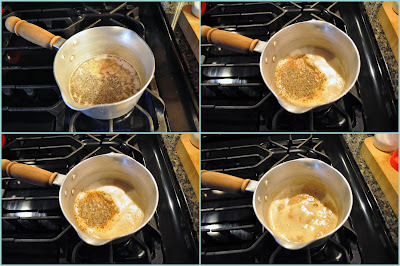 , decrease the black pepper, if you love cardamom, bump that up. The recipe is a great guideline and making your own Chai the seasons and your mood change! Warning–Nerdy science note: The flavors that make spices taste delicious are all aromatic compounds. Aromatic compounds are made of molecules that contain a structure known as a benzene ring, meaning they dissolve best in alcohols or fats. You may have noticed this when making drinks, that adding a twist of lemon to a martini adds significantly more flavor in a shorter amount of time than adding a twist of flavor to a glass of water. Similarly, if you make this chai with a non-fat milk, you won’t extract as many flavors from the spices as if you make it with a milk that has some fat. So do your spices a flavor, and don’t make this with skim milk. Nerdy science note done. Put all the ingredients in the pot and let it come to a slow boil until it turns a beautiful, rich color. Best to use loose leaf tea, so it is necessary to strain the tea once it is fully cooked (having a spouted pot will really help decrease spills). Strain the tea, sit back, and enjoy. Pour all ingredients into a (preferably spouted) saucepan. Place over medium heat. Allow to heat until small bubbles appear around the perimeter of the milk. Stir the chai, scraping the bottom to avoid scalding the milk. When the milk comes to a boil, turn off the heat and stir well. Bring to a boil once again, turn off the heat and stir well. Allow to steep for a few minutes. Strain carefully into a cup, and serve. If you are using whole spices, weigh out the appropriate amount, place in spice grinder and grind into a fine powder. Mix all the spices together, store in an airtight jar in a cool, dry part of your kitchen. Do not expose to too much sunlight. 1 In a 2-qt saucepan, add spices to 1 cup of water. Bring to a boil; remove from heat; let steep for 5-20 minutes, depending on how strong a spice flavor you want. 2 Add 4-6 cups of whole milk to the water and spices. If you don’t have whole milk, you can also use non-fat or low-fat milk, just add some cream to it, a few tablespoons. Bring the milk and spice mixture just to a boil and remove from heat. 3 Add the tea to the milk and let steep for 5 to 10 minutes to taste. (Option at this point – reheat to a simmer and remove from heat.) You can add sugar at this point, or serve without sugar and let people put the amount of sugar in they want. Traditionally, sugar is added before serving. 4 Strain into a pot. Serve. Add sugar to taste.